KiCad is twenty-five years old — like most PCB design software — and right now it’s the best Open Source tool to lay out your circuits, plop down a few resistors, and create a PCB from scratch. Over the last few years, a lot of people have been turning to KiCad to design some very impressive boards, something no doubt related to the fact that KiCad is free in both the beer and speech senses. During this Hack Chat, we’ll discuss current and future features in everyone’s favorite Open Source EDA suite. This is a great chance to make suggestions and put forth wish list items. 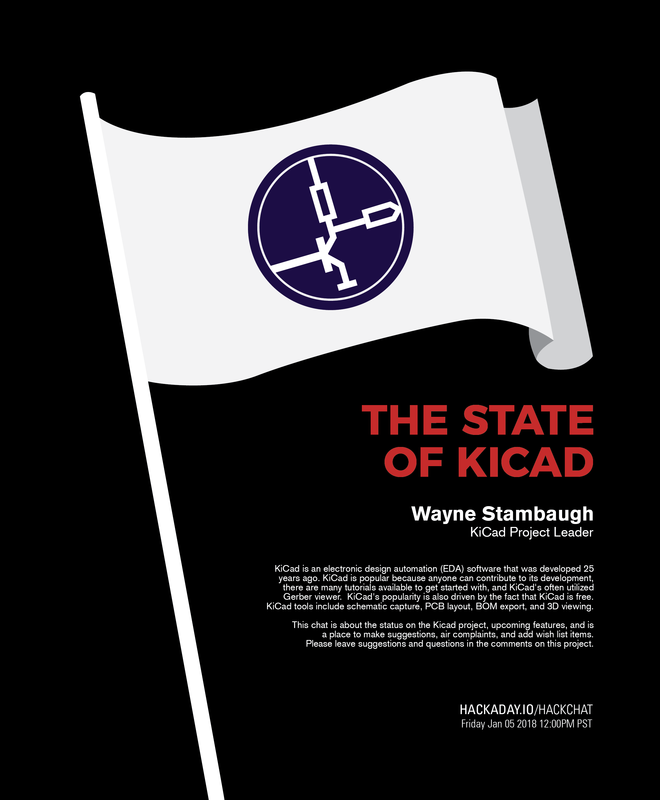 Wondering if KiCad is pronounced ‘Kai-CAD’ or ‘Key-CAD’? It’s the latter, but don’t let that stop you from asking Wayne to change that. What goes on under the hood, and why should you never trust the autorouter? Where do you turn when you’re just starting out in KiCad? If you have something you’d like to ask the KiCad devs, make sure to add it to our discussion sheet. To do that, just leave a comment on the Hack Chat Event Page. Our Hack Chats are live community events on the Hackaday.io Hack Chat group messaging. This Hack Chat is going down Friday, January 5th at noon, Pacific time. Time Zones got you down? Here’s a handy countdown timer! Some people want everything on the cloud, while others refuse to put even the smallest scrap of data on the Internet. Most of us fall somewhere in between. A few years ago, we talked about a few cloud-based PCB layout programs including one called EasyEDA. We were impressed because it was a full package: schematic capture, simulation, and PCB layout. It was free to use, although they would give you a quote for producing your boards, though you were under no obligation to buy them. Of course things change in two years, so if you are curious how EasyEDA is doing, [Yahya Tawil] posted an in-depth review. Some of the new features include an autorouter and the ability to order parts from a BOM directly, not just PCBs. The cloud aspect is handy, not only because you don’t have to install and update software to use it anywhere, but because it is very natural to collaborate with others on projects. We did notice, though, that the autorouter can run in the cloud, or you can download and run it local because it apparently loads the server significantly.